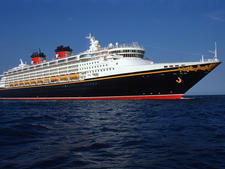 Disney Dream was Disney's first new ship in 12 years when it debuted in 2011, and it represented the company's step into bigger, bolder and smarter ships. 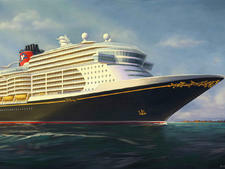 So it's not surprising that the 128,690-ton, 2,500-passenger vessel (4,000 max occupancy) -- and its near-twin, Disney Fantasy -- is 40 percent larger and two decks taller than the company's previous ships, Magic and Wonder. And while Disney kept the same classic design inspired by the ocean liners of the 1920s and 1930s, this ship is far from the same-old; a closer look reveals many innovative features and spaces. Advanced uses of technology throughout the ship include virtual portholes in inside cabins and "Enchanted Art," digital paintings that come to life as you admire them. Families can pick up a packet at the Midship Detective Agency and use the digital works to solve a mystery. Interactive Magic Play Floors, a ship-limited social network and a sound studio enhance the kids clubs, and "Wave Phones" in every cabin can be used to call or text other passengers, as well as receive messages from the youth staff. A late-2015 refurbishment added even more impressive features, including spruced-up adults-only spaces, a spa juice bar, a "Wreck It Ralph"-themed sweet shop and high-tech kids club play areas that will amaze even the most tech-savvy adults. If you're a huge Disney fan (or your kid is), you don't need to be convinced to sail with one of the best family entertainment enterprises around. If you're not -- or have never seen a Disney ship -- you might have the mistaken impression that this line is only for families with little kids who love Mickey Mouse and princesses. Sure, young Disney fans are the line's bread and butter, and they always have been. Princess meet-and-greets take place daily and are hugely popular, the shows feature character cameos and songs from the Disney movies, and the family pools are definitely overrun with splashing, shrieking young-uns. The influence of the Mouse ranges from subtle to obnoxious. It's omnipresent but generally not overwhelming. "Hidden" Mickeys can be found just about everywhere on the ship: in artwork, on railings, on dinnerware, in cabins. What's endearing to some, though, might be overkill to others. And a few areas on the ship were definitely overlooked. The "sports" deck, for example, offers a cute nine-hole mini-golf course and a basketball court but nothing strikingly groundbreaking or athletic. 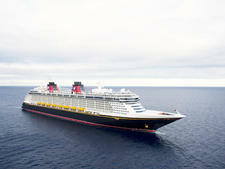 But, Dream does offer evidence that a Disney cruise is not only for kids or overgrown Mouse fans. The art deco decor onboard is elegant and jazzy and imparts an old-world luxury, mostly refined, but with a touch of glitz. The pioneering, tech-friendly kids clubs, with spaces themed on Pixar and Disney movies, have a huge amount of beanbag-chair- and videogame-filled real estate dedicated to tweens and teens, a noble effort to better cater to the older-than-8 crowd. Entertaining dinner shows help keep fidgety youngsters occupied during long sit-down meals. Adults can appreciate high-quality, multicourse dining at Remy; the creative use of costuming and technology (and some mildly adult humor) in the shows; and grown-up activities, such as wine tastings and late-night games and dancing. They have access to a pool, a sun deck, bars and lounges, restaurants and even shore excursions where those younger than 18 are not allowed. That's good because, in the words of Walt himself, "You're dead if you aim only for kids. Adults are only kids grown up, anyway." Above all else, the line pays attention to details -- little things like putting lids on kids' drinks to minimize spills and pouring ketchup in the shape of Mickey's head in the dining rooms, and adding touches like a life preserver and pair of Donald Duck legs to the side of the funnel to make it look as if the loveable character has gotten himself stuck. Disney is strongly influenced by American and Canadian travelers, and its primary market, of course, is families (especially those with kids younger than 8). Its new approach to teen cruisers may help the line appeal to families with older kids. Beyond that, Disney has strong appeal for multigenerational travelers, and its superb spa, bar district and alternate dining facilities mean that adults of any age will find their own spaces onboard. 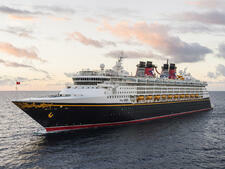 Disney Dream has two dress codes: Princess Formal and Pirate Casual. We're kidding, of course, but it's true that princess dresses and other costumes for kids (and fun-loving adults) are always in style. The actual dress code is casual during the day and what we'd call "family resort casual" most evenings. Nice shorts and jeans are allowed in the dining rooms, but tank tops and swimwear are not. However, Disney cruisers love to dress up, and themed evenings -- whether formal-optional, Caribbean or pirate night -- are wholeheartedly embraced. Dream's three- to five-night cruises feature one night each of pirate/tropical and formal-optional dress, with the remainder of the evenings being cruise casual. The dress code in Palo and Remy is fancier -- no shorts, capris, flip-flops or sneakers. Jeans are allowed in Palo but not Remy. A jacket (but not a tie) is required for men at Remy. Gratuities, which are given to the waiters, assistant waiters, head waiters and stateroom attendants, are $12 per person, per day. You can prepay gratuities up to three days prior to sailing or add tips to your onboard bill. Envelopes are distributed on the final evening so you can personally thank your room steward and wait staff with cash if you choose, or use cards denoting the prepaid amount. An automatic 15 percent service charge is added to cocktail and other beverage purchases; an 18 percent charge is added to spa treatments.